A Sitemap (Site Map) is a list of pages of a blog accessible to crawlers or users and gives an overall picture about web/blogs. According to Google, "A sitemap is a file where you can list the web pages of your site to tell Google and other search engines about the organization of your site content. Search engine web crawlers like Googlebot read this file to more intelligently crawl your site." Sitemaps, as the name implies, are just a map of your site - i.e. on one single page you show the structure of your site, its sections, the links between them, etc. Sitemaps make navigating your site easier and having an updated sitemap on your site is good both for your users and for search engines. Sitemaps are an important way of communication with search engines. Important: If you are a blog/site owner then never forget to submit your sitemap at Google Webmaster Tools. If you do not have knowledge about how to submit sitemap in Google webmaster tool then click here to learn. 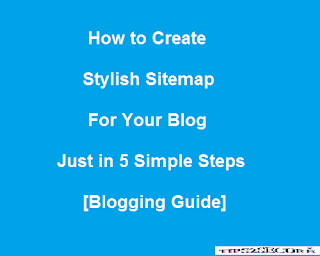 Just follow below-given steps to create a Good looking and stylish Sitemap for blogs. Today am going to teach you about how to create an attractive sitemap for your blog readers and users, which looks like this. Step 3: Create a page with the name "sitemap". Step 4: Click on 'HTML' write. Step 4: Now paste this code in Body like shown in below Image. Step 5: Click on Update/ Publish. Warning: Don't replace or edit the above given code or it will not work for you. You have done, now you can show this sitemap anywhere on your blog by showing and linking your sitemap page. How much time it will take after submitting the sitemap to be get indexed by search engines? Well, its depend on search engine crawlers that how often they are crawling your blog or website. Generally, for new blogs crawling speed is low but when you start posting on the regular basis then crawl rate and speed both will be incresed. If it is taking long time to be indexed or not indexing your all submitted pages, then don't worry that's not a problem. It will be done automatically after sometime. Never submit sitemap again and again. 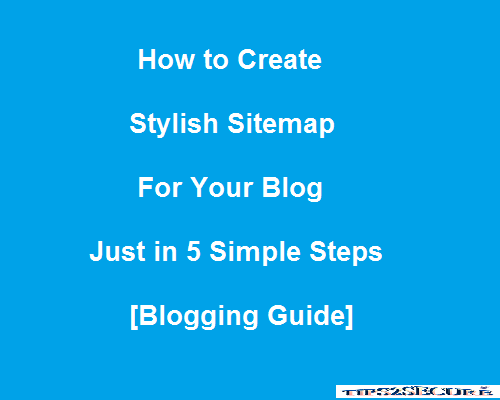 Message: I hope that you have enjoyed 'Create Stylish Sitemap for Blog readers in 5 Steps [Blogging Guide]' article. However, if you want me to deliver more articles then please share my post. You can use Social Sharing Widget provided at the end of every post. After all, Sharing is Caring!.